There are several reasons that lead people to rent a private holiday home in Cinque Terre. One of the most common is that hotels are really a few in the area. It always happens in protected lands. Here new buildings cannot be added to the existing nucleus. So, due to the rapid and increasing growth of tourists, all inhabitants, years and years ago, decided to open their houses to visitors. They gave the travel industry a way of becoming bigger and more important day after day. At first it was the old village woman that let a couple or a single visitor rent just a tiny room of their tiny, simple apartment. They shared their bathroom with owners and most of the times their table. It must have been so strange for her to have next door someone who barely could speak a word in Italian. He looked even stranger since she maybe did not even speak Italian, but just local dialect. Sometimes bizarre people came as visitors of this area. Artists, painters, photographers, theatre directors fell in love with this land and followed an unusual way of life and curious habits, more curious for people who barely had left their houses even to reach the close by village. At the same time, thanks to the stranger’s money the old villager could get relief from her extremely poor life, a way to make a living from her four house walls. That very same house so empty after her husband had died and sons and daughters had left for seeking fortune and jobs in town, for La Spezia or Genoa the less risky ones, for Milan or better “America”, the most adventurous ones. This is history, of course, but such a unique pleasure was for travellers, sometimes, to live right in the house of the villagers and share their habits and way of life. And maybe the old woman who had let him her son’s room probably felt closer to her child when hearing foreign people speaking that unknown language, that very same language that her child was hearing on the other side of the ocean…and so the tourist tradition of renting private homes in Cinque Terre Riviera started. I dare say that no bread or soup had better flavour than that the first visitors of Riomaggiore and Manarola, Vernazza, Monterosso and Corniglia had the chance to taste years and years ago when arriving in these our and unknown villages. And today, it is still a pleasure for a tourist to rent a private room or apartment in this land, it adds so much more taste to a holiday: one can start the day saying “Ciao” e “Come Va?” to ones’ landlord and then what’s better than going down to the cafeteria, mingling with locals in front of a cappuccino. And then buying groceries at the same, tiny stores where your property owner buys. You, for sure, will get advice from her on what kind of vegetables or piece of meat to buy, and then what’s more precious than listening to recipes suggestion right there? And to add more taste to your holiday you can even have a chef coming over to your rented apartment for a fantastic and memorable cooking class or a dinner prepared only for you and your dear ones. Then, renting an apartment will let you have for you and your family at mostly the the same price of a hotel room, a LARGER living space, which is so important when traveling for a long time, not to mention having, in many cases as in apartments such as Villa Montale or La Pavona in Monterosso, a washing machine, to make more comfortable and relaxing your trip with the feeling of staying at home-far-from-home, in any season. 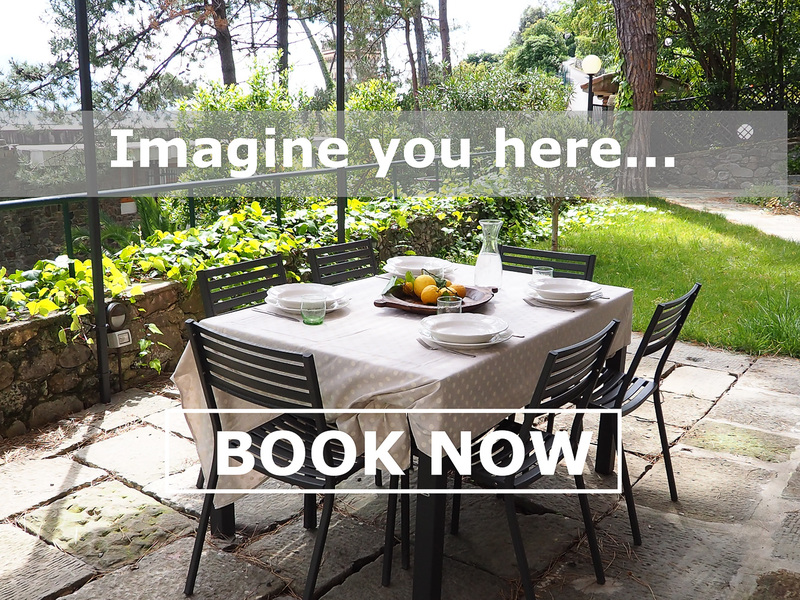 Private garden areas or patios then add a plus to your choice: no better than sipping a glass of delicious Cinque Terre wine at night when coming home from close by beaches and restaurants!